Debut CD Launch - Come Get Your Copy! Poet Samira Obeid will launch her debut CD Metaphor at this month's Oral Fixation. Come watch her spit her truth with other Tampa Bay poets this Thursday and bring your wallet because this is one album you are going to want to buy. 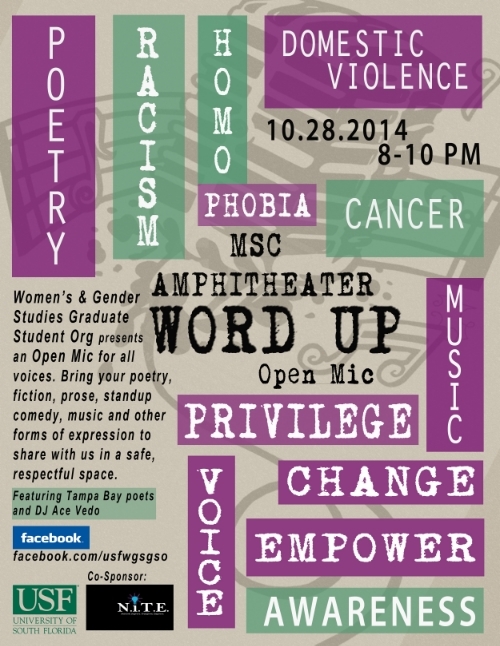 Join the Women's and Gender Studies Graduate Student Organization at Word Up, our first event this semester. Word Up is a safe space for all voices to share their poetry, prose, music, fiction, short story, stand up comedy and any other form of expression you'd like to bring to the mic. Featuring DJ Ace Vedo and Tampa Bay poets Kali, Dennis Amadeus, Aubrey Diaz and Sam Obeid.